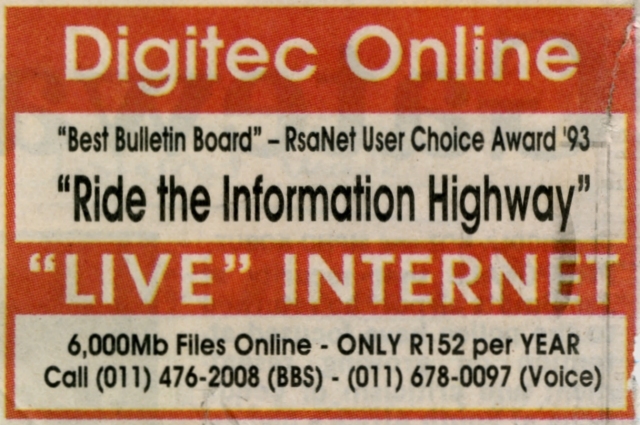 The following aims to be a complete list of all Bulletin Board Systems that ever existed in South Africa. Information was sourced from numerous newsletters, adverts, nodelists, bulletins, personal notes, and any available issues of Roblist. It is by no means complete and only as correct as source data permits. Additions and corrections are welcome. An explanation of the fields can be found at the bottom of the table. Alienation Andrew Tavenor (011) 472-4157 1 1993 1994 Previously "CD-ViSiON AH"
Apogee Software Kobus Jooste (012) 333-8308 2 1994 1995 Also known as "Software People"
Breadboard Ivan Frimmel (011) 918-1861 1 1989 1992? CD-ViSiON AH Andrew Tavenor (011) 472-4157 1 1993 1993 Became "Alienation"
Chameleon BBS Gary Colman (021) 462-4580 2 1993 1995 Different BBSes? Chameleon BBS Johan Benecke (021) 439-6546 1 1996 Different BBSes? Chariot BBS Katja Christiansan (021) 72-9703 1 1993 1995 Previously "Clarion Support"
ChatNet Keith Waters (024) 56-3112 1 1992 1994? Clarion Support Katja Christiansan (021) 72-9703 1 1992 Became "Chariot BBS"
The Compu'Cafe AH Graham Downs (011) 902-2693 1 1996 Predecessor to "Dungeon Keep"
Data Link AH Robert Derot (031) 21-2457 1 May 1993 1993 Previously "Rob's BBS"
Depth of Insanity AH Ashley Kleynhans (011) 864-5787 1 1992 Became "House of Games"
Door et al Evan Brighton (021) 21-1486 1 Oct. 1990 Related to "Et Al"? Dungeon Keep Graham Downs (011) ???-???? 1 2000 Previously "The Compu'Cafe"
Gandalf's Deon Maartens (011) 433-1988 1 Sep. 1992 1993 Predecessor of "Mon Ami"
House of Games AH Ashley Kleynhans (011) 864-5787 1 1993 Previously "Depth of Insanity", became "SASA"
The Igloo Greg Mahlknecht (031) 764-3377 1 1994 Successor of "Programs Paradise"
Information Security BBS Oliver Steudler (021) 24-2208 1 1993 1995 Successor of "Virus Resource Centre"
Lux Africae John Leuner (012) 346-4726 1 1995 Successor of "Psychogony"
Mon Ami Deon Maartens (011) 433-1988 1 Apr. 1993 Dec. 1993 Successor of "Gandalf's Garden"
Mother One Ivan Frimmel (011) 425-3430 1 1992 1995? Online Direct Clive Jones (011) 807-0436 1 1993 Predecessor of "CALM"
Programs Paradise Greg Mahlknecht (031) 764-3377 1 Sep. 1992 Succeeded by "The Igloo"
Psychogony BBS AH John Leuner (012) 46-1257 2 1993 1994 Predecessor of "Lux Africae"
Rand Data Systems Richard Kruger (011) 412-2540 1 1993? 1994 Preceded by "Soft-Mail"
Rob's BBS AH Robert Derot (031) 21-2457 1 May 1993 Predecessor of "Datalink"
SASA AH Ashley Kleynhans (011) 864-5787 1 1993 1994 Previously "House of Games AH"
Soft-Mail Richard Kruger (011) 412-2540 1 1992 1993? 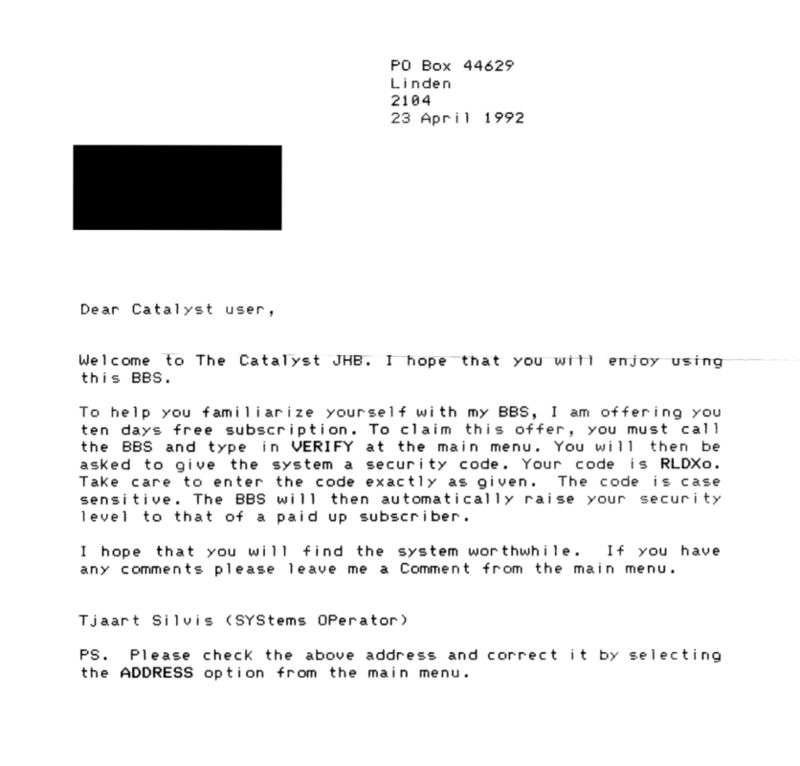 Predecessor of "Rand Data Systems"
Virus Resource Centre Oliver Steudler (021) 24-2208 1 Sep. 1992 Became "Information Security BBS"
BBS Name: Because sometimes it changed. SysOp/s: The name of the guy who ran the show (it was usually guys). If two names (joined by a +) are listed, we are given to understand it as a collaborative effort while some BBSes, it seems, were eventually placed in the care of another person (listed underneath). Commercial/support BBSes often had a rotating roster of SysOps. 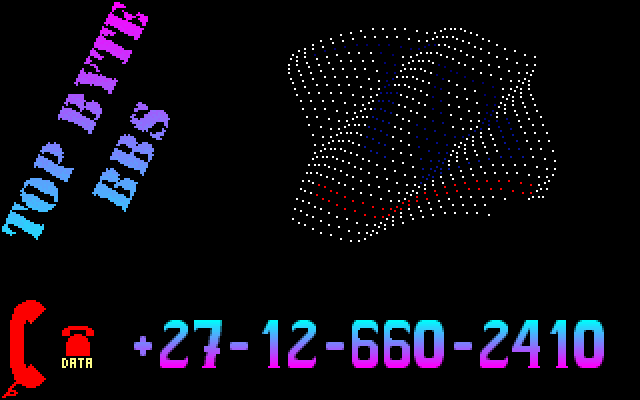 Number/s: All dial-in/phone numbers ever associated with the BBS. 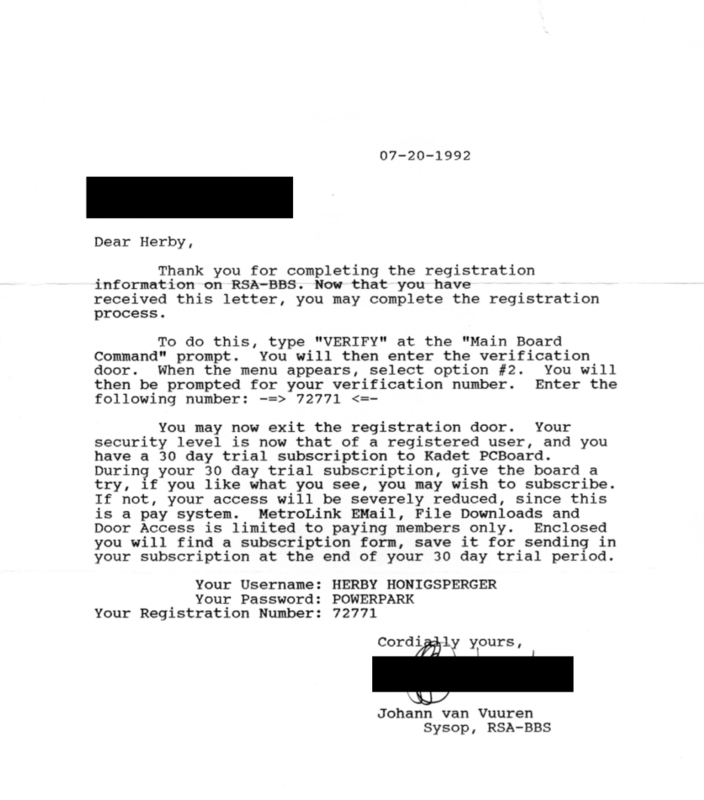 Telnet addresses were excluded. Nodes: Although there may have been several phone numbers associated with a BBS, it doesn't mean that all were active at the same time. 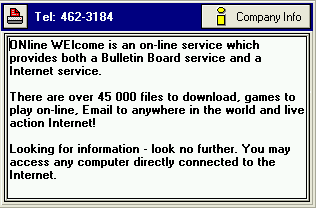 For instance, if a board had two numbers associated with it but the "Nodes" field only shows "1", then it's clear that the phone number changed at least once -- which would be typical for a BBS that started as an after-hours (AH) board and later got its own dedicated line. Or the SysOp simply moved house. Conversely, some BBSes may have started with one number only, then gradually added nodes until they either scaled down, or closed down. The number indicates the known maximum number of simultaneous nodes of a given BBS -- ever. Dates active: Again, these dates are based on any date stamping of the original available lists and a little bit of sleuthing. A date range of "Oct. 1993 to 1995" means that we know the BBS was active in October 1993 and that it was still active in the year 1995 -- but for all we know it could've been launched as early as 1991 and shut down in 1998 only. We simply do not have that data. If you have any additional information, please contact me via this page.